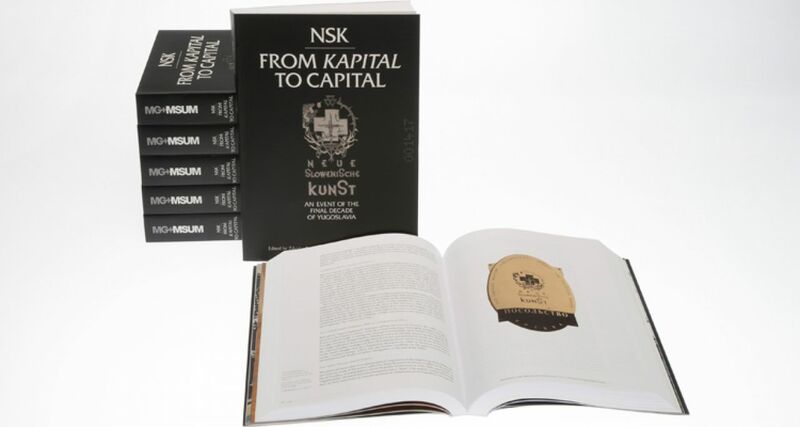 The book NSK from Kapital to Capital. Neue Slowenische Kunst––An Event of the Final Decade of Yugoslavia., edited by Zdenka Badovinac, Eda Čufer and Anthony Gardner, is one of the four finalists for the prestigious Alfred H. Barr Jr. Award for Smaller Museums, Libraries, Collections, and Exhibitions. Given by CAA (College Art Association) from New York, the award is part of the CAA 2017 Awards for Distinction, which honor the outstanding achievements and accomplishments of individual artists, art historians, authors, conservators, curators, and critics whose efforts transcend their individual disciplines and contribute to the profession as a whole and to the world at large. The awards ceremony is to be held during Convocation at the 105th Annual Conference in New York, on Wednesday, February 15, 2017. Also the exhibition NSK from Kapital to Capital. Neue Slowenische Kunst––An Event of the Final Decade of Yugoslavia., which traveled to the Van Abbemuseum in Eindhoven and the Museum of Contemporary Art Garage in Moscow last year, met with great acclaim. Early this year, the renowned New York art blogazine Hyperallergic listed the Moscow exhibition as one of the fifteen best exhibitions of 2016. In 2017, the exhibition is traveling to one of the globally most important museums, the Museo Nacional Centro de Arte Reina Sofía in Madrid, where it will run over the summer, from June 27 to October 30. Traveling to the Madrid museum in its entirety, the exhibition will outline the development and work of the three founding groups and the five NSK departments. A (shortened) Spanish version of the book NSK from Kapital to Capital. Neue Slowenische Kunst––An Event of the Final Decade of Yugoslavia will accompany the exhibition in Madrid.